Sic Bo ("Dice Pair") is an ancient Chinese game that is very simple to play. The game is played on a table and uses three dice. 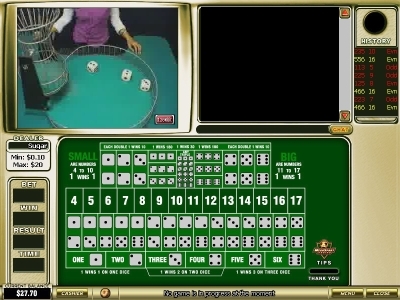 The player has to bet on the outcome of the dice when rolled. A round in Sic Bo starts by the players placing bets on possible outcomes of the three dice. The bets are placed on the table and once everybody has placed their bets, the dealer rolls the dice. The dealer then removes all the losing bets from the table and pays out all the winning bets that where made. Certain outcomes carry a payout of 1:1, and other more scarce outcomes up to a pay out of 180:1 ! Single Number - If a player bets on a single number (1 to 6 corresponding to the numbers on the dice) and the number comes up on one of the dice, the payout is 1:1. If two of the dice come up with the number, the payout increases to 2:1. On all three dice, payout increases to 3:1. Combination - The player can bet on a certain combination of numbers to come up on the dice (e.g. that one dice will be a 2 and one of the other a 4). This bet's payout is at 5:1. Total - The player can also bet on the total of the three dice, ranging from 4 to 17. This bet's payout ranges from 6:1 up to 50:1, depending on the bet that was made. Small or Big - The player can also bet on whether the total of the three dice will be big (total between 11 to 17) or small (total between 4 and 10). Specific Triplet - The player can bet that all three dice will have the same value and proceeds to nominate the value. Payout is usually 150:1. Any Triplet - The player can also bet that all three dice will have same value, but without specifying the value. Payout 24:1. Pair - A bet that two of the dice will match can also be made. Payout 8:1. Remember to verify with the casino about the payouts that they offer and for any other house rules for Sic Bo they might have!